The Eucharist is the sacrament that makes present in the liturgical celebration of the Church the Person of Jesus Christ, Body, Blood, Soul and Divinity, and his redeeming sacrifice, in the fullness of the Paschal mystery of his passion, death and resurrection. This presence is not static or passive (as an object in a place), but rather an active presence where Christ makes himself present with the dynamism of his saving love. In the Eucharist he invites us to accept the salvation he offers us and to receive the gift of his Body and Blood as the food of eternal life. This enables us to enter into communion with him, with his Person and his sacrifice, and also with all the members of his Mystical Body, the Church. Both in Sacred Scripture and in the Tradition of the Church the Eucharist is called by various names that reflect the multiple aspects of this sacrament and express its limitless richness, though no name can exhaust its meaning. The following are some of the more significant ones. a) Names that recall the origin of the rite: Eucharist,  Breaking of Bread, Memorial of the Lord's Passion, Death and Resurrection; the Lord's Supper. b) Other names that underline the sacrificial aspect of the Eucharist: the Holy Sacrifice; the Holy Sacrifice of the Mass; the Sacrament of the Altar; the Host (the Victim who is immolated). c) Other names that try to express the reality of Christ's presence in the consecrated elements: the Sacrament of the Body and Blood of Christ, the Bread of Heaven (cf. Jn 6:32-35; Jn 6:51-58), the Blessed Sacrament (because the Holy of Holies is there, the very holiness of God Incarnate). d) Other names that refer to the effects the Eucharist brings about in each of the faithful and in the whole Church: Bread of Life, the true bread of children, the Cup of Salvation, Viaticum (so that we may not grow weary on our way to our heavenly Homeland), Communion. This last name indicates that through the Eucharist we are united to Christ (personal communion with our Lord Jesus Christ) and to all the members of his Mystical Body (ecclesial communion in our Lord Jesus Christ). e) Finally, the Eucharistic celebration is called the Mass, or the Holy Mass, from the term in the Latin rite that refers to the “sending forth" of the faithful after communion. Among all these names, “the Eucharist" is the one that has prevailed in the West, and has become the most common name for both the Church's liturgical action in which the Lord's memorial is celebrated, and for the Lord's Body and Blood. In the Eastern Church, the Eucharistic celebration, especially since the 10th century, has usually been designated by the expression “Holy and Divine Liturgy." “Because of the Blessed Trinity's love for man, the presence of Christ in the Eucharist brings all graces to the Church and to mankind." The Eucharist is the most exalted sacrament. “For in the most Blessed Eucharist is contained the whole spiritual good of the Church, namely Christ himself, our Pasch and the Living Bread which gives life to men through his Flesh—that Flesh which is given life and gives life through the Holy Spirit." The other sacraments possess a sanctifying power that flows from Christ, but the Eucharist makes the very Person of Christ truly, really and substantially present. The incarnate Son of the Eternal Father, who now reigns in glory at his side, is made present, with the saving power of his redeeming love, so that all men and women might enter into communion with him and live through him and in him (cf. Jn 6:56-57). Moreover, the Eucharist is the summit towards which all the other sacraments lead in the spiritual growth of each of the faithful and the whole body of the Church. Thus Vatican II affirmed that the Eucharist is the source and the summit of Christian life, the center of all the Church's life. All the other sacraments and all the works of the Church are directed towards the Eucharist because their aim is to lead the faithful to union with Christ, present in this sacrament. (cf. CCC , 1324). Even though the Eucharist contains Christ himself, the channel through whom divine life comes to humanity and the goal to which all the other sacraments are ordered, the Eucharist is not a substitute for any of them, neither Baptism, nor Confirmation, nor Penance, nor the Anointing of the Sick; indeed the Eucharist can only be consecrated by someone who has validly received the sacrament of Holy Orders. Each sacrament has its role in the sacramental economy and in the life of the Church. In this sense the Eucharist is considered the third sacrament of Christian initiation. Ever since the first centuries of Christianity, Baptism and Confirmation have been seen as a preparation for taking part in the Eucharist, as necessary steps for entering into sacramental communion with the Body of Christ and his Sacrifice and thus to be more vitally inserted in the mystery of Christ and his Church. During his public life our Lord foretold the Eucharist in the synagogue at Capharnaum, in the presence of those who have become his followers after witnessing the miracle of the multiplication of the loaves and fishes with which he fed the multitude. (cf. Jn 6:1-13). Jesus made use of that sign to reveal his identity and mission, and to promise the Eucharist. Jesus said to them truly, truly I say to you, it was not Moses who gave you the bread from heaven; my Father gives you the true bread from heaven. For the bread of God is that which comes down from heaven, and gives life to the world. They said to him Lord, give us this bread always. Jesus said to them, I am the bread of life; he who comes to me shall not hunger, and he who believes in me shall never thirst . . . I am the living bread which came down from heaven. If anyone eats of this bread, he will live forever; and the bread which I shall give for the life of the world is my flesh . . . He who eats my flesh and drinks my blood has eternal life, and I will raise him up on the last day. For my flesh is food indeed, and my blood is drink indeed. He who eats my flesh and drinks my blood abides in me, and I in him. As the living Father sent me, and I live because of the Father, so he who eats me will live because of me ( Jn 6:32-35, 51, 54-57). Our Lord Jesus Christ instituted this sacrament at the Last Supper. The three synoptic Gospels (cf. Mt 26:17-30; Mk 14:12-26; Lk: 22:7-20) have passed on the account of the institution. The following is the synthesis of the accounts given in the Catechism of the Catholic Church. “Then came the day of Unleavened Bread, on which the Passover lamb had to be sacrificed. So Jesus sent Peter and John saying, 'Go and prepare the Passover meal for us, that we may eat it…' They went…and prepared the Passover. And when the hour came, he sat at table, and the apostles with him. And he said to them, 'I have earnestly desired to eat this Passover with you before I suffer; for I tell you I shall not eat it again until it is fulfilled in the kingdom of God. '… And he took bread, and when he had given thanks he broke it and gave it to them, saying, 'This is my body which is given for you. Do this in remembrance of me.' And likewise the cup after supper, saying, 'This cup which is poured out for you is the New Covenant in my blood.'" (CCC , 1339). Jesus, then, celebrated the Last Supper in the context of the Jewish Passover, but at the Lord's Supper something completely new took place. The center was not the lamb of the Old Testament, but rather Christ himself, the Body that he gave up (offered in sacrifice to his Father for mankind), and his Blood poured out for many for the forgiveness of sins (Mt 26:28). Thus we can say that Christ, rather than celebrating the Old Passover, announced and carried out, anticipating it sacramentally, the New Passover. “Do this." With these words he designated those who can celebrate the Eucharist, the Apostles and their successors in the priesthood; and he conferred the power to celebrate it and determined the basic elements of the rite: the same ones that he employed. Therefore the celebration of the Eucharist requires bread and wine, the prayer of thanksgiving and blessing, the consecration of the gifts into the Body and Blood of the Lord, and the distribution of and communion with this most Sacred Sacrament. “In remembrance of me," as a memorial of me. Thus Christ directed the apostles (and in them their successors in the priesthood) to celebrate a new “memorial" that would replace the one celebrated in the Jewish Passover. 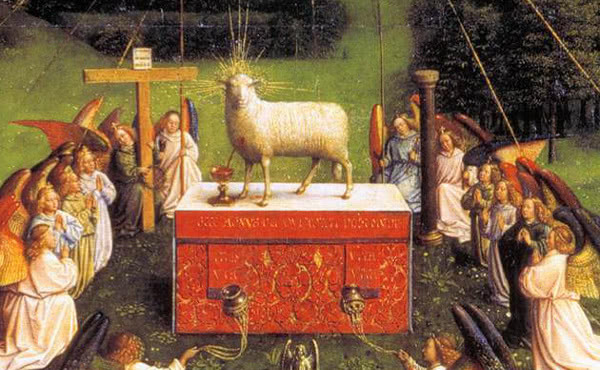 This memorial rite has a special efficacy: it not only helps the community of believers to “remember" Christ's redeeming love, his words and gestures during the Last Supper, but also, as a sacrament of the New Law, makes the reality signified truly present: Christ himself, 'our Paschal Lamb' (1 Cor. 5:7), and his redeeming sacrifice. 3. Liturgical celebration of the Eucharist. The Church, obedient to our Lord's command, celebrated the Eucharist in Jerusalem without delay (Acts 2:42-48) , in Troas (Acts 20: 7-11), in Corinth (1 Cor 10:14, 21; 1 Cor 11:20-34), and everywhere that Christianity spread. “It was above all on 'the first day of the week,' Sunday, the day of Jesus' Resurrection, that the Christians met 'to break bread' (Acts 20:7). From that time down to our own day the celebration of the Eucharist has been continued so that today we encounter it everywhere in the Church with the same fundamental structure" ( CCC , 1343). Faithful to Jesus' commandment, the Church, guided by the Spirit of truth (Jn 16:13), the Holy Spirit, when she celebrates the Eucharist does no more than follow the Eucharistic rite as performed by Jesus at the Last Supper. The essential elements must be the same as those at the original Eucharist: a) the assembly of Christ's disciples, called by him and united around him, and b) the carrying out of the new memorial rite. From the beginning of the Church's life, the Christian assembly celebrating the Eucharist has been hierarchically structured. 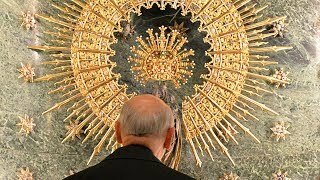 “At its head is Christ himself, the principal agent of the Eucharist. He is high priest of the New Covenant; it is he himself who presides invisibly over every Eucharistic celebration. It is in representing him that the bishop or priest acting in the person of Christ the head (in persona Christi capitis ) presides over the assembly, speaks after the readings, receives the offerings, and says the Eucharistic Prayer. All have their own active parts to play in the celebration, each in his own way: readers, those who bring up the offerings, those who give communion, and the whole people whose 'Amen' manifests their participation" (CCC , 1348). Each should fulfil their own ministry with no confusion between the ministerial priest, the common priesthood of the faithful, and the ministry of the deacon and other possible ministers. The essential and necessary elements for the sacramental sign of the Eucharist are bread made from wheat flour  and wine made from grapes,  along with the words of consecration that the priest pronounces in persona Christi in the Eucharistic Prayer. Thanks to the effectiveness of our Lord's words and the power of the Holy Spirit, the bread and the wine are converted into efficacious signs, with ontological reality and not merely as a sign, of the presence of the “Body given up for us" and the “Blood poured out" by Christ, that is, his Person and his redemptive sacrifice (cf. CCC , 1333 and 1375). Catechism of the Catholic Church , 1322-1355. John Paul II, Enc. Ecclesia de Eucharistia , 17 April 2003, 11-20; 47-52. Benedict XVI, Apost. Exhort. Sacramentum Caritatis , 22 February 2007, 6-13; 16-29; 34-65. St Josemaria, Homily, “The Eucharist, Mystery of Faith and Love," in Christ is Passing By , 83-94. Vatican II, Const . Sacrosanctum Concilium , 47. The term “eucharist" means act of thanksgiving and recalls Jesus' words at the Last Supper: And he took the bread, and when he had given thanks he broke it and gave it to them saying …. (Lk 22:19; cf. 1 Cor. 11:24). St Josemaria, Christ is Passing By , 86. Vatican II , Decr. Presbyterorum Ordinis , 5. Vatican II Const. Lumen Gentium ,11. John Paul II, Enc. Ecclesia de Eucharistia , 29. Cf. Vatican II, Const. Sacrosanctum Concilium , 22; Congregation for Divine Worship and the Discipline of the Sacraments, Instr. Redemptionis Sacramentum , 14-18. Cf. Roman Missal, Institutio Generalis , no. 320. In the Latin rite, the bread must be unleavened, that is, with no raising agents (cf. ibid.). See Roman Missal, Institutio Generalis , no. 319. In the Latin Church a little water is added to the wine. The words that the priest says as he adds the water give the meaning of this liturgical gesture: “By the mystery of this water and wine may we come to share in the divinity of Christ, who humbled himself to share in our humanity" (Offertory ). For the Fathers of the Church, this action also signified the union of the Church with Christ in the sacrifice of the Eucharist ( St Cyprian , Letter 63, 13)..